We are registered with OFSTED for children aged from 4 years upwards. 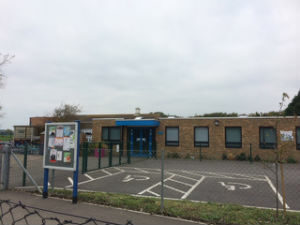 We operate our Out Of School facilities at Downview School on Wroxham Way in Felpham. Blackbirds offer a wide variety of play environments both in and out of doors and a vast range of activities including art and crafts, small world, construction, games and many others. We also provide a wide selection of snack and drink options. 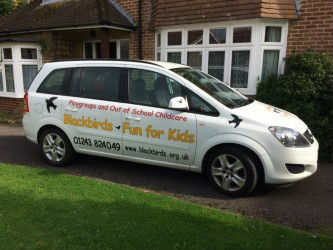 We use our branded cars to transport children from Bishop Tufnell School to our facilities at Downview. This Club is open after school until 6pm every school day. Our EARLYBIRDS Breakfast Clubs offer before school care from 7.45am at both Downview and Bishop Tufnell Schools (Bishop Tufnell's Earlybirds' Breakfast Club is provided by us in the Felpham Children & Family Centre). We offer breakfast* of cereal and toast as well as fresh fruit and/or fruit juice. Children are able to play in or outdoors until it is time to go to their classes. Reception, year 1 and year 2 children are escorted by a member of our team. *Breakfast, included in price, is available up to 8.15am only. Blackbirds operates a Holiday Club from 7.45am until 6.00pm during all school holidays and also on most Downview School INSET DAYS. You can now book your childs Holiday Club place on-line. Book now.